Today's mortgage rates as well as refinance rates have slightly gone up according to Bankrate.com. Here is how the national averages look like for all 30 year, 15 and 5/1 ARM rates. The 30 year fixed mortgage rate is at 3.83 percent. Last week it was 3.78 percent. As you can see the average rate today is .0.05% higher than the last week. 15 year fixed mortgage rate is even higher today compared to last week. Today the 15 year fixed rate according to Bankrate.com national average is 2.90 percent. Last year those rates were at 2.84 and the change is 0.06 percent. Whereas, the change in the 30 year mortgage rate compared to last week was only 0.05 percent. The 5/1 ARM rate today is at 3.25 percent. It was at 3.17 percent last week. As you can see the change is even more higher with 0.08 percent, compared to 30 year's 0.05 and 15 year's 0.06 percent change. Today's refinancing rates are higher compared the last week's too. Here is how the national averages are again according to Bankrate.com. Current refinance rates have moved little, compared to current mortgage rates. The 30 year fixed refinance rate is 3.91 percent. Last week this refinancing rate was lower at 3.88% and the change is 0.03%. Now, the 15 year fixed refi rate is at 2.98 percent. 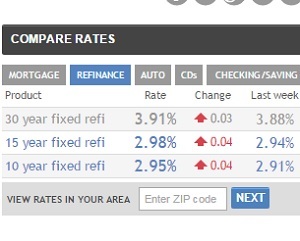 Last week this refi rate was only 2.94% and the change is 0.04%. Interestingly the change with 10 year fixed refinance rate is the same as with the 15 year fixed refinance rate. Today's 10 year fixed refinance rate is at 2.95% while those were at 2.91 percent. Current mortgage rates have stayed almost the same hovering around 4 percent since 2013. These are historical low interest rates, but not every home buyer has access to these rates because their ability is linked to their credit score.